Are you familiar with your gas tank’s pressure regulator? Is it working properly? If you are like most individuals, you are probably not even sure just what a pressure regulator is. This is why the best water pressure regulator installation and repair company in San Diego is at your service. Unfortunately if gas or water pressure regulator is not working properly, you could be looking at a great deal of wear and tear on your water and gas-powered appliances. The water pressure regulator is a valve that is responsible for turning off the flow of water when it gets to a certain level of pressure. It is important that this device is maintained because if it stops working properly, it can lead to major problems with your water lines. If you have noticed water coming out of your water heater valve, it could be a sign that your water pressure regulator needs to be replaced. At Plumbing and Drains Solutions, we can handle the installation and repair of these devices. 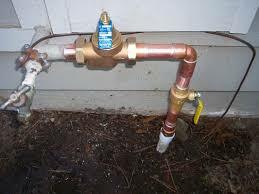 At Plumbing and Drains Solutions, our professional and courteous technicians have been trained in all the latest techniques for installing, adjusting and repairing pressure regulators for either your gas or water systems. One quick call and we will have a technician out to your home to evaluate the condition of your pressure regulators and to advise you on any repairs or replacements that we see as being necessary. Contact our experienced plumbers at (619) 345-5550 to schedule an appointment. We serve customer in San Diego. Water pressure regulators are considered safety devices rather than luxury ones. If you do not have a working water pressure regulator in place, it can lead to the water pressure getting too high and damaging your fixtures. It can also cause the water pressure to get too low, which could render your taps/faucets useless or your showering experience uncomfortable or ineffective. While you may be tempted to try a DIY solution and replace or fix your regulator yourself, this can cause serious damage to your plumbing system. All water pressure regulator services should be handled by an experienced professional. If you have noticed your water pressure is higher than usual, you may have a malfunctioning pressure regulator. Our plumbers can help by testing your water pressure and inspecting your system to see exactly what is happening. We are the best water pressure regulator installation and repair company in San Diego and we want to do whatever we can to help you avoid leaks and damage to your pipes. Also, don’t forget, at Plumbing and Drains Solutions, we have an emergency plumbing team standing by 24 hours a day 7 days a week for all of your emergency plumbing needs. Call us today for a plumbing service estimate from San Diego’s top rated plumbers. Call Plumbing and Drains Solutions now at (619) 345-5550 to request a free quote on water pressure regulator services in San Diego.